(0 Customer Reviews) | Write Review 12 issues per year At iDrum, we want to bring our readers all the latest news, gear and interviews on a global scale and include enhanced content with video tutorials and product reviews. Readers can enjoy easy navigation with a tablet friendly design, fluid page scrolling and convenient video content display. Regular features include our tuition pages, news features, interviews with the world's best players, and top-class competitions where we give away fantastic prizes every issue. Welcome to the free taster issue of iDrum – Drummer magazine's digital companion – in this interactive mag you'll find videos, slideshows and loads of digital content that we just can't put in a traditional magazine. We want you to see exactly how much extra content we cram into each issue of iDrum. We have cameras pointed at our interview subjects, review gear and tutors to give you the most in-depth coverage of drumming and percussion available anywhere. Woody Woodmansey, drummer for David Bowie, describes the early days with the icon, and how he’s been playing some of the classic albums in their entirety. Rock brothers Carmine and Vinny Appice give us the latest news on their Metal All Stars tour, which stops in London this month, while Josh Macintyre tells us about his band of musical siblings, Marmozets, who are smashing up the music scene right now. There’s a long overdue catch up with Peter Erskine, who has been busy creating play-along apps and working with some seriously high-profile orchestras. 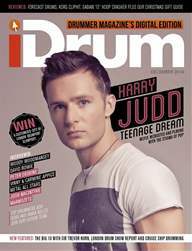 While our cover star this month is Harry Judd, who talks about the pressures of growing up with pop, life with McFly and gives details of recording the debut album of pop supergroup McBusted. UK session guru Ash Soan takes time out of recording The Voice to start a series of three guest tuition pages, and we are thrilled to welcome Anika Nilles to the regular tuition team as well. Our Christmas gift guide will give you ideas for the drummers in your life (or what to write on your own list for Santa), there’s a free wallplanner for 2015 (which you can download by clicking on the frontcover), and Drumport are giving away a ‘City of London’ Glowport for one lucky reader. For those who missed it, or for the ones who want to relive the weekend, we have a three-page report on the London Drum Show. And there’s a couple of new additions along with all of our usual features. I told you it was a cracker! At iDrum, we want to bring our readers all the latest news, gear and interviews on a global scale and include enhanced content with video tutorials and product reviews. Readers can enjoy easy navigation with a tablet friendly design, fluid page scrolling and convenient video content display. Regular features include our tuition pages, news features, interviews with the world's best players, and top-class competitions where we give away fantastic prizes every issue. You'll receive 12 issues during a 1 year iDrum magazine: Never miss a beat magazine subscription. You'll receive 12 issues during a 1 year iDrum magazine: Never miss a beat magazine print subscription.